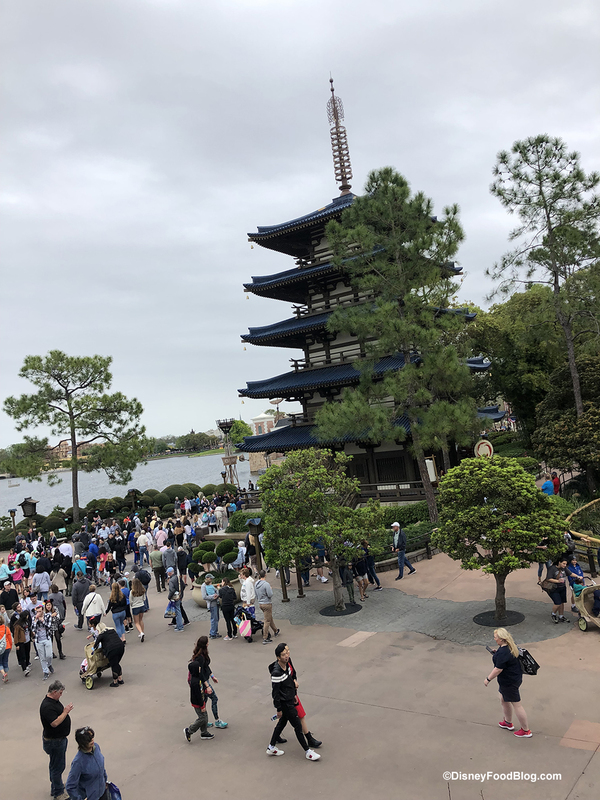 Epcot is a busy park these days! 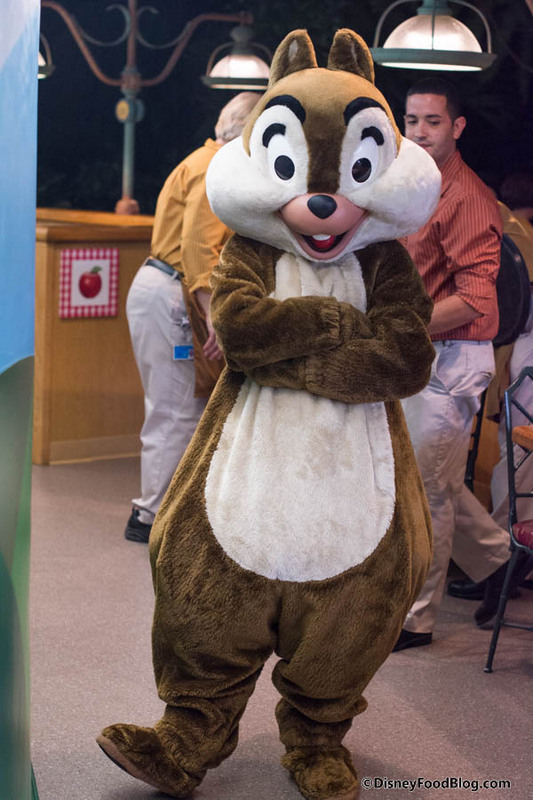 Each visit finds construction progress, menu updates, and new must-have merchandise! See what we found this week! We started our visit out checking on the progress of the Guardians of the Galaxy attraction. Chef Paul Bocuse — one of the most celebrated Chefs of all time — passed away on January 20, 2018, at the age of 91. Chef Paul’s passing is certainly a loss to the culinary world, but to many Disney and Epcot fans as well. 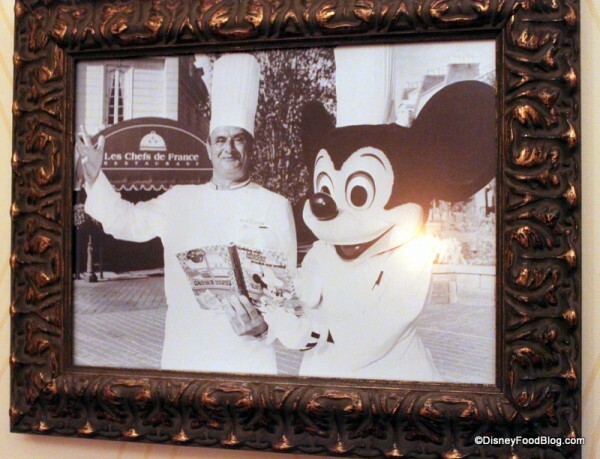 In the early 80s, Chef Bocuse was invited by the Walt Disney Company to create restaurants for the France Pavilion in EPCOT Center. The result was Les Chefs de France, which now runs under his son, Jérôme. 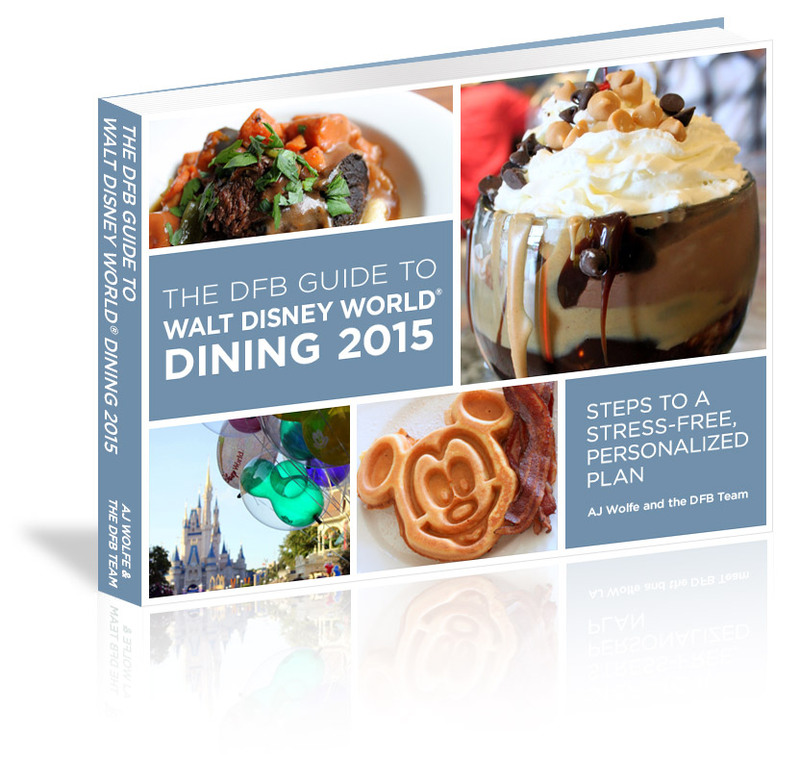 Disney Food Blog FAQ: How Much Should I Budget for the 2016 Epcot Food and Wine Festival? It’s here! I can hardly believe it, but the 2016 Epcot Food and Wine Festival is finally underway! The fun officially kicked off on September 14 and runs until November 14. That’s more than eight weeks of savoring all that this special event has to offer! And we had so much fun eating and drinking along the Promenade to discover our Best of the Fest dishes and drinks to recommend! But of course, you can’t forget the tons of events that take place during the Festival. From Low Cost Events like Culinary Demonstrations and Beverage Seminars to high end Special Events like Party for the Senses, there’s so much to do at every turn. But here’s the catch — nearly all of it comes with a pricetag. So that, of course, begs the question: how in the World do you plan for the Food Lover Trip of the Year? We get it! 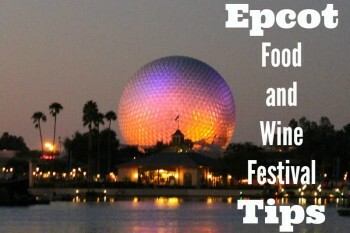 So we’re here for you with some great tips for Budgeting for the Epcot Food and Wine Festival. 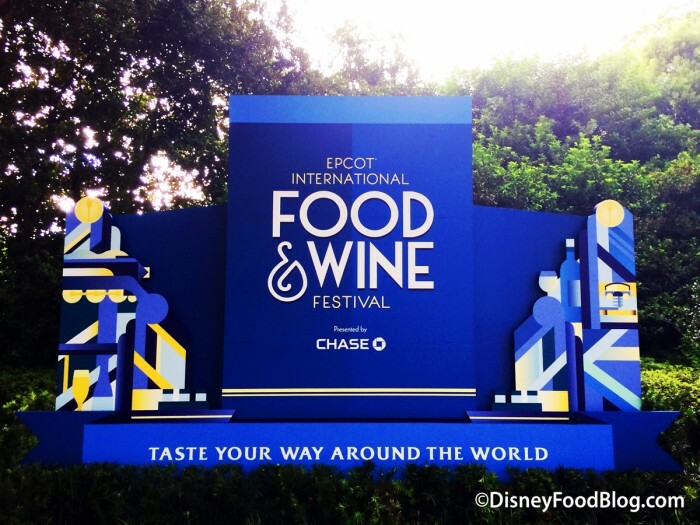 And if you like what you see, be sure to check out our 2016 DFB Guide to the Epcot Food and Wine Festival, completely updated with everything you can expect to enjoy at this year’s event! How Much Money Should I Budget For a Day at the Epcot Food and Wine Festival? 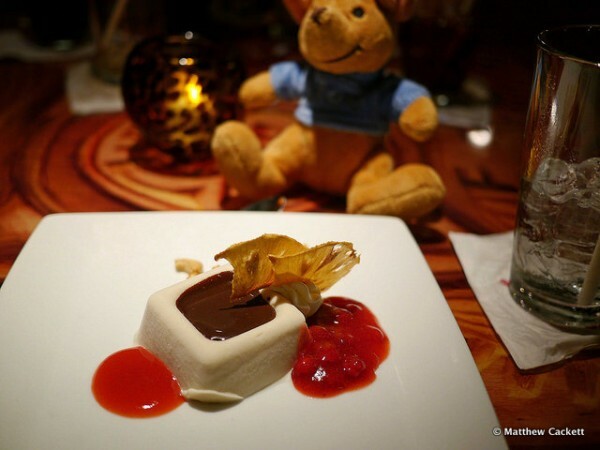 We previously shared with you our picks for the Best Disney Dining Plan Value in Disney Signature Dining. 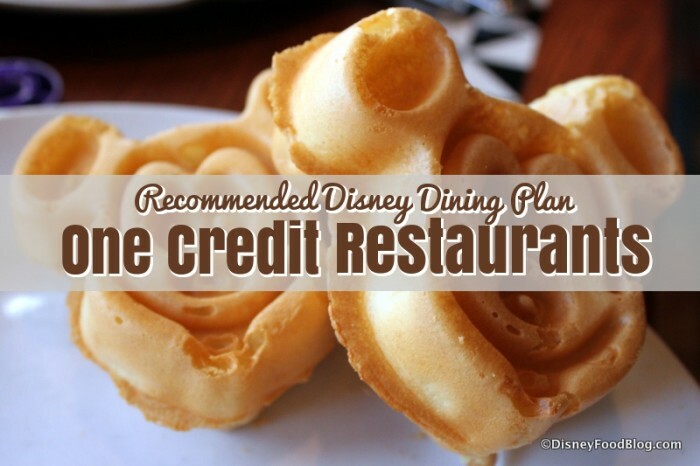 Today, we continue our series exploring which Disney Restaurants offer the best value for your Disney Dining Plan credits! 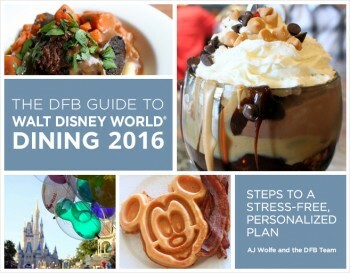 One of the biggest questions that we get here at DFB is whether or not the Disney Dining Plan is a good deal. To begin answering the question, we armed ourselves with calculators and menus and ran the numbers to see which spots had the most expensive average entrees. But it’s more than that, isn’t it? I mean, no matter how much the average check runs, if the food or the atmosphere doesn’t appeal to you and yours, it won’t be a good value, no matter how you slice it. With the calculations in mind, we were curious to determine which One-Credit Disney Table Service Restaurants offered the best deal or value price-wise — but also could be recommended by the experts here at DFB for atmosphere and food quality. All of the restaurants that we considered are One-Credit spots, meaning they’ll require just one credit to dine with the Disney Dining Plan. Here are our picks for the restaurants that give you the best overall bang for your Disney Dining Plan buck when it comes to single credit table service spots. When we set out to determine which one-credit restaurants offered you the most in terms of sheer cost, one trend emerged immediately: you can’t go wrong by spending your credit on a Character Meal. We Can’t Resist Eating with this Guy! 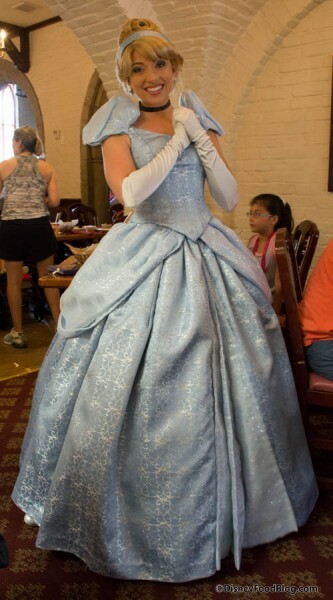 And with only one exception (Cinderella’s Royal Table), all Disney World character meals require only one DDP table service credit. 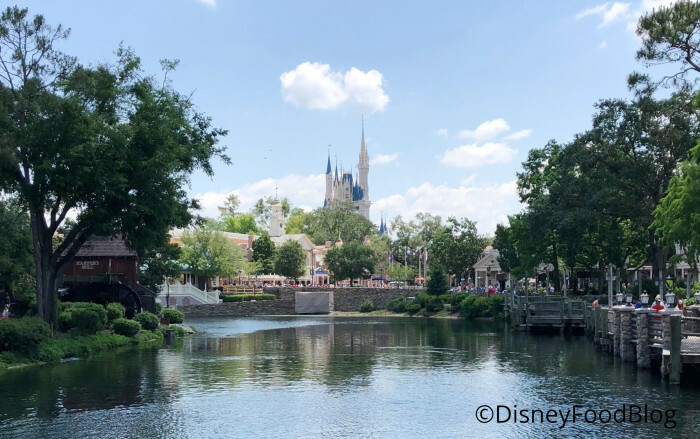 And while character meals are not one size fits all — you should definitely check out our tips before booking one — they’re for sure an experience everyone can enjoy with a little planning. As for our favorite, this year we are really enjoying character meals that are served family-style like ‘Ohana’s breakfast. These include Garden Grill at Epcot, which you can now book for Breakfast, Lunch, and Dinner. Or enjoy the Princesses at Akershus. 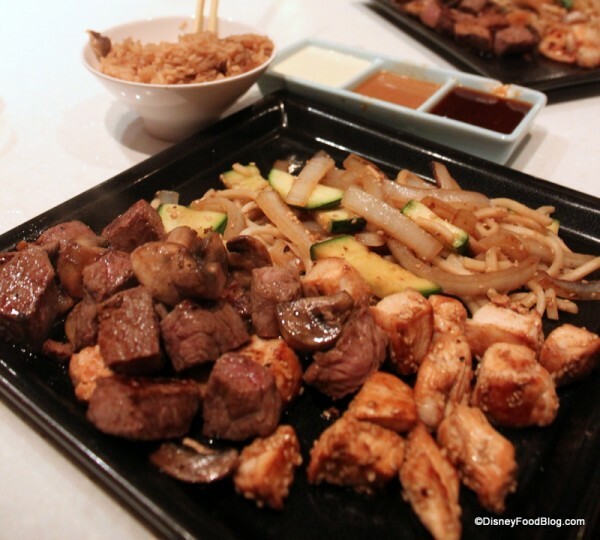 You can still enjoy the koldtbord selections and all you care to eat, but meals come plated. 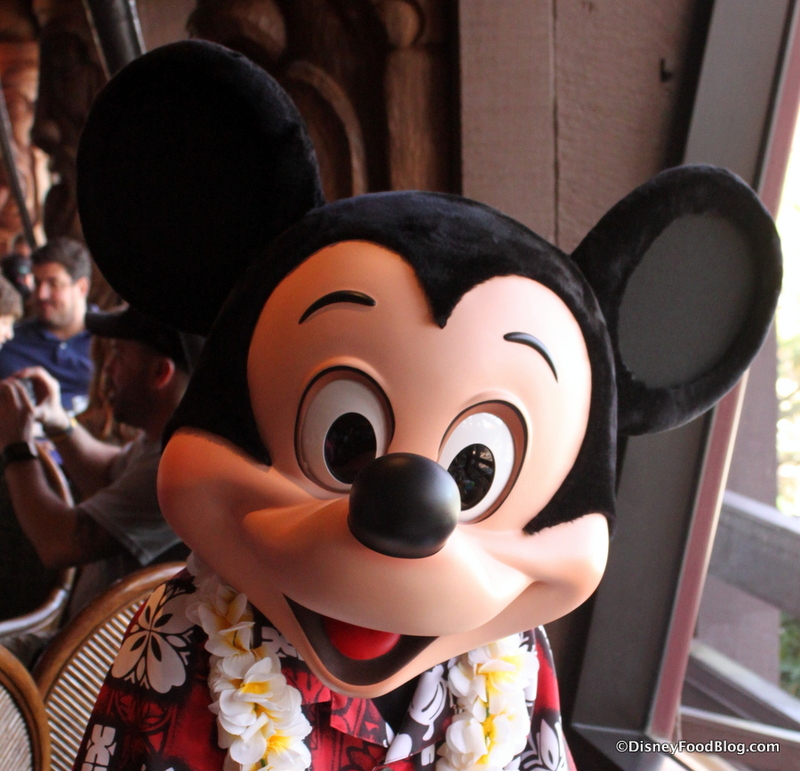 But my favorite remains the Best Friends Character Breakfast at ‘Ohana. For a combination of cute characters (Mickey in a Hawaiian Shirt, and Lilo is awesome!) and delicious food, it just can’t be beat. And while buffets are great for a bounty of offerings, sometimes it’s nice to sit back and let the food come to you — especially if there’s a baby or toddler along for the ride. Hot on the heels of character meals though, you should probably also consider other buffets or all you care to enjoy service formats if you’re truly interested in “getting your money’s worth”. Boma at Disney’s Animal Kingdom Lodge doesn’t offer characters — but I don’t see that as a bad thing. The food here is interesting and delicious. Don’t miss the Soups or the Carving Stations at Dinner! (Here’s the recipe for that killer Coconut Curry Chicken Stew!) Breakfast offers some great pastries and more. 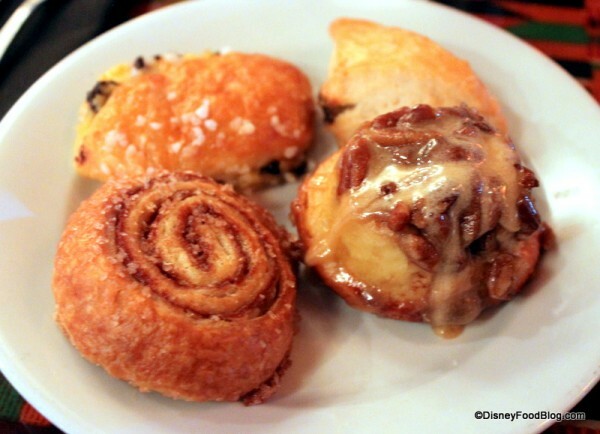 Breakfast Pastries from one of our favorite buffets — Boma in Disney’s Animal Kingdom Lodge! The restaurant serves breakfast and dinner, and we’ve enjoyed both. And because Boma doesn’t feature characters, I find the ambiance to be a little more relaxing as a result. But don’t forget spots that offer all you care to enjoy, but do the heavy lifting for you. If you wish that everyday was Thanksgiving Day (but without the clean up! 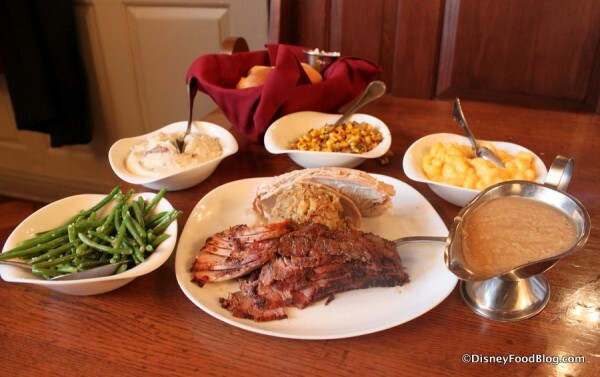 ), then make your advance dining reservation for Liberty Tree Tavern in Magic Kingdom. Besides getting a hearty helping of history, you’ll also see endless platters of Turkey with all the trimmings. The Full Dinner Spread at Liberty Tree Tavern! But if you’re looking to spend those credits wisely, then don’t leave Magic Kingdom just yet. Because any Disney Food Bucket Lister will tell ya — you’ve gotta book dinner at Be Our Guest Restaurant at least once. For starters, this spot is truly magical. If you’ve ever wanted to tumble through a movie screen and join in the action, this is your chance to do it, as Beast’s Castle has been reproduced in painstaking detail. But then, there are some pretty great reasons to eat here as well. Of course, the menu is French-inspired. We’ve tried pretty much everything, and give high marks to the Potato Leek Soup, the Pork Chop, and of course, the Grilled Strip Steak! And if you enjoy a glass of wine or a beer with dinner, take advantage of ordering one here — the only spot in Magic Kingdom where you can enjoy this indulgence. Choosing Dessert may be tough. We enjoyed most of the options, but the Master’s “Grey Stuff” dessert will be the most high-profile. What’s that? You’d like to go to the REAL France? Well, I can’t deliver that to you at Disney, but I can get you pretty close to the real deal. If you travel over the Epcot, that is. When you get there, head to World Showcase for some of the best spots to spend those table service credits. While many of the restaurants in this international village boast steep pricetags, we love some better than others. And in terms of beautiful atmosphere and consistently delicious food, Les Chefs de France gets a gold star from me. I know, I know. 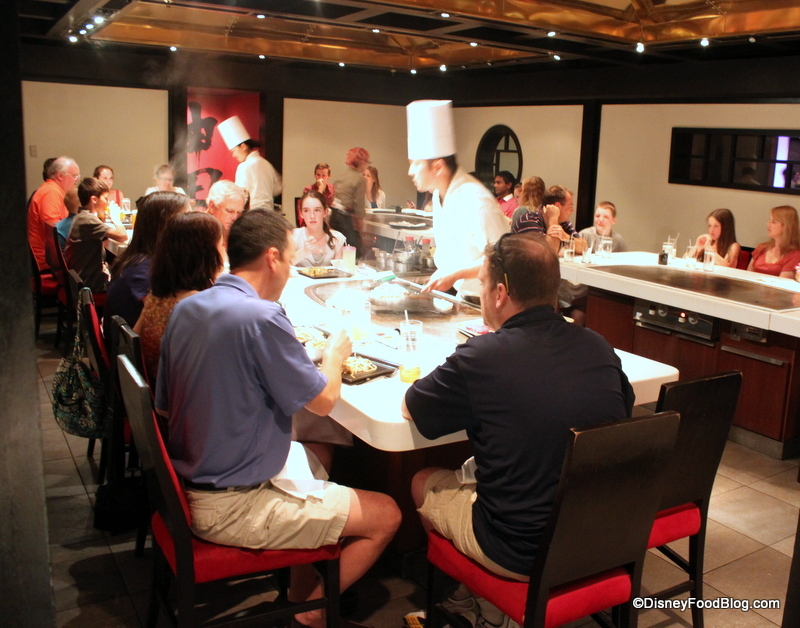 Epcot international dining can be less than authentic. But all of the restaurants in the France Pavilion are owned by the Bocuse Group, and I’ve enjoyed lots of fare that reminded me of my time traveling as a student through France and Switzerland. Service can be slow and reserved. But the restaurant offers a beautiful setting. But as I mentioned, you aren’t limited merely to France in Epcot. There’s a whole world out there, of course. When it comes to fun and value, consider Teppan Edo. And the food is bountiful. While I’m partial to ordering the Steak, I also love the combos here. Steak and Chicken or Steak and Shrimp give you the opportunity to enjoy different textures and flavors. And with bountiful sides, I guarantee you won’t leave the table hungry. And there you have it! With so many varied experiences, flavors, and settings, it’s hard to go wrong with Disney Dining. But you won’t go wrong if you decide to try a few of our favorite one-credit options! Now, I’d love to hear from all of you guys! What are your best picks for value when it comes to DDP one credit table service spots? Leave a comment with your favorites! We are enjoying a leisurely lunch today at Les Chefs de France, the table service restaurant in Epcot’s France Pavilion. This iconic eatery has been the location of many happy meals and memories for me through the years. But as with other Disney spots, it’s always good to check in occasionally. Disney restaurants can be wildly inconsistent; a place that’s spot-on during one meal can go south the next time you visit. So I always make it a priority to check back in at all of Disney restaurants to see if they’ve gotten better or worse, and to show you what they’re serving up lately. You get to choose if they’re worth your time and money. I have very early memories of this restaurant. When you walk by at night, it just looks so cozy inside! And it’s honestly beautiful any time of day. It’s been a stellar week for Disney food fans! 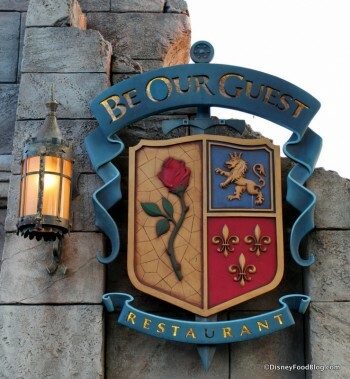 After months of speculation, Disney not only confirmed that Be Our Guest Restaurant would begin service breakfast…breakfast service began before the week was out! Currently in a “testing phase” through June 18, we enjoyed our very first early morning trip to the Beast’s castle this week! While we’ve offered you a First Look at just what breakfast is about, we’ll have more details for you in our full review on Monday. For now, let’s take a close look at all of the interesting news that we’ve brought you this week. Just click on the links to see more detail about each item. St. Patrick’s Day included fun celebrations at favorite spots in Disneyland’s Downtown Disney. A NEW Wishes Dessert Party will debut on July 5 at Walt Disney World’s Magic Kingdom. Booking is open now! 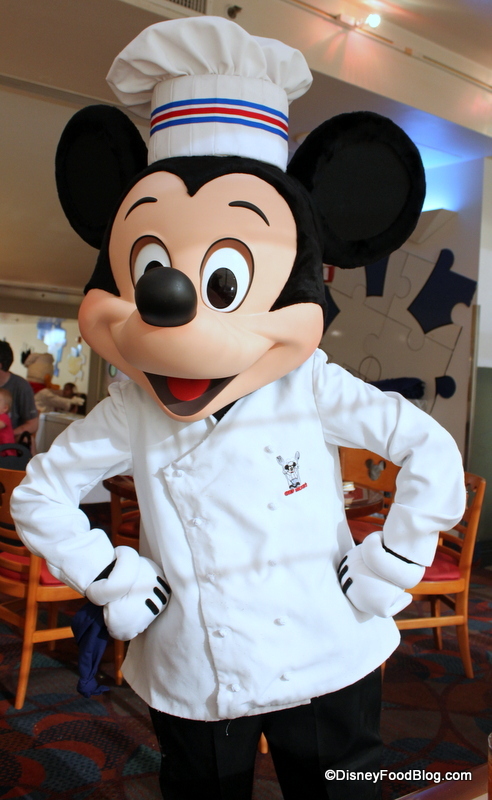 Mickey Check Meals debut on Disney Cruise Line. 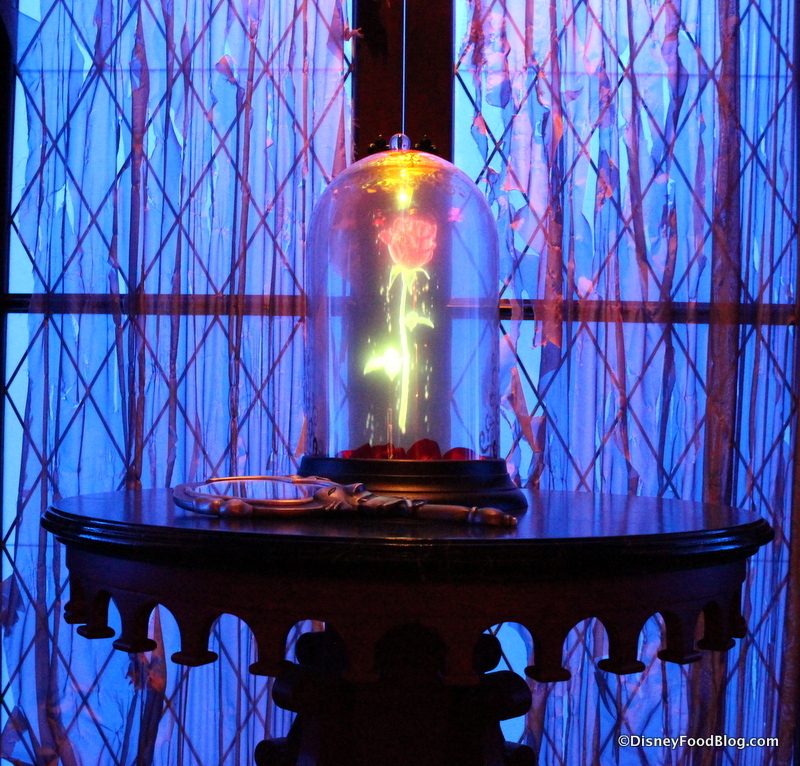 We offer you a FIRST LOOK at breakfast in Be Our Guest Restaurant! We are trying some delicious Disney Cupcakes at two of our favorite spots — Apple Spice and Black Forest Cupcakes at Sunshine Seasons, and a Hot Chocolate version at Contempo Cafe. 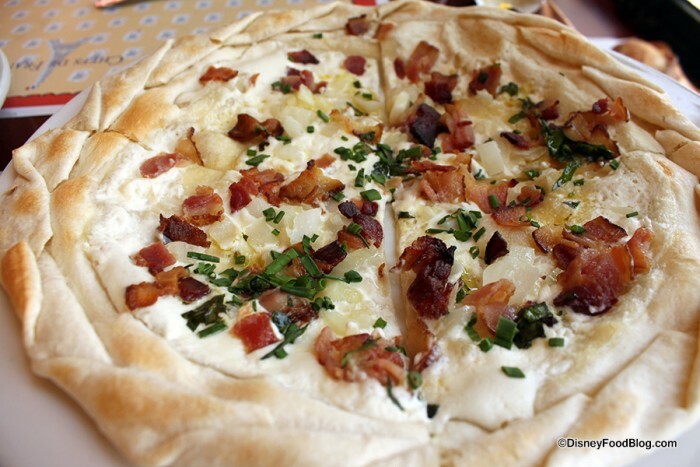 Today, we’re featuring delicious reader finds from the France Pavilion in Walt Disney World’s Epcot! When it’s time for coffee, nothing beats a well-crafted Cappuccino. 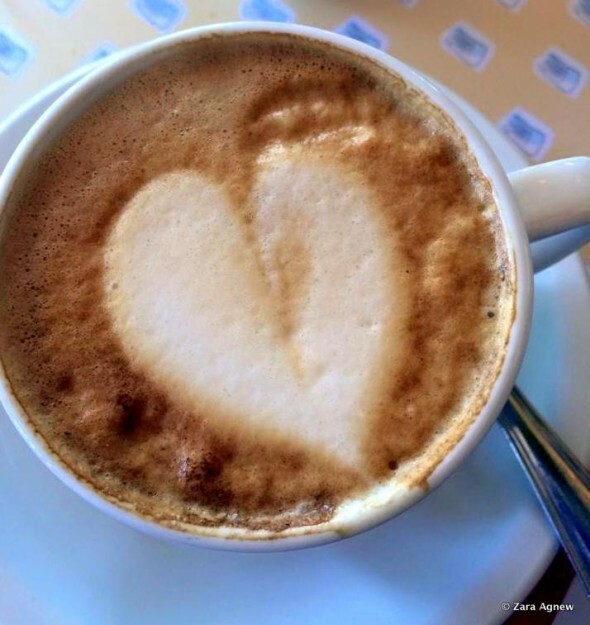 Reader Zara Agnew’s husband ordered one at Les Chefs de France, and it was topped with this beautiful heart. Froth art is the best! 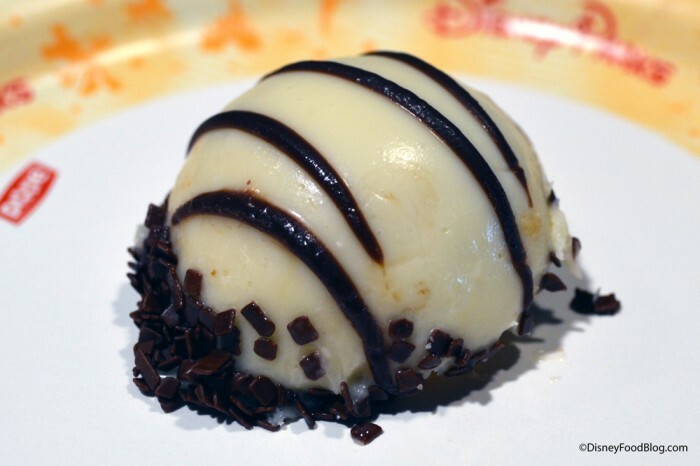 Disney Food Pics of the Week: Gorgeous Desserts! 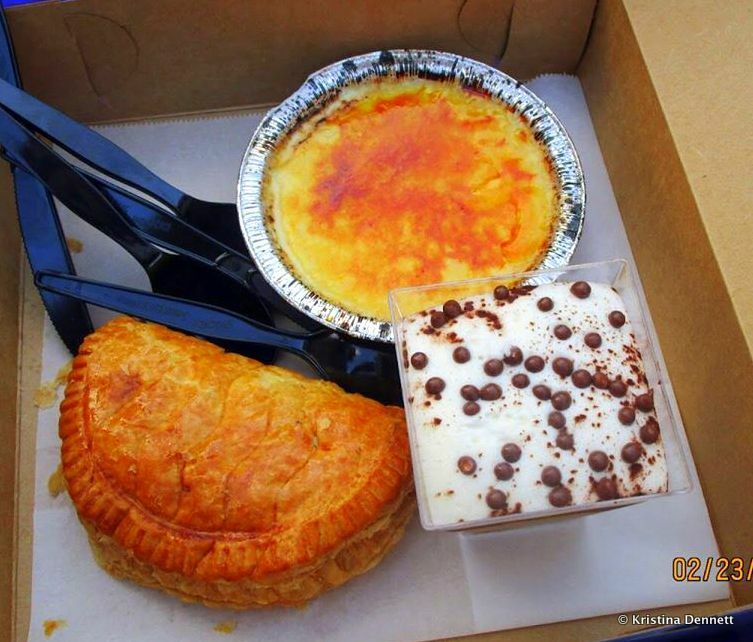 And today, we are all about just a few of the beautiful dessert options that you have all over the Disney Universe! 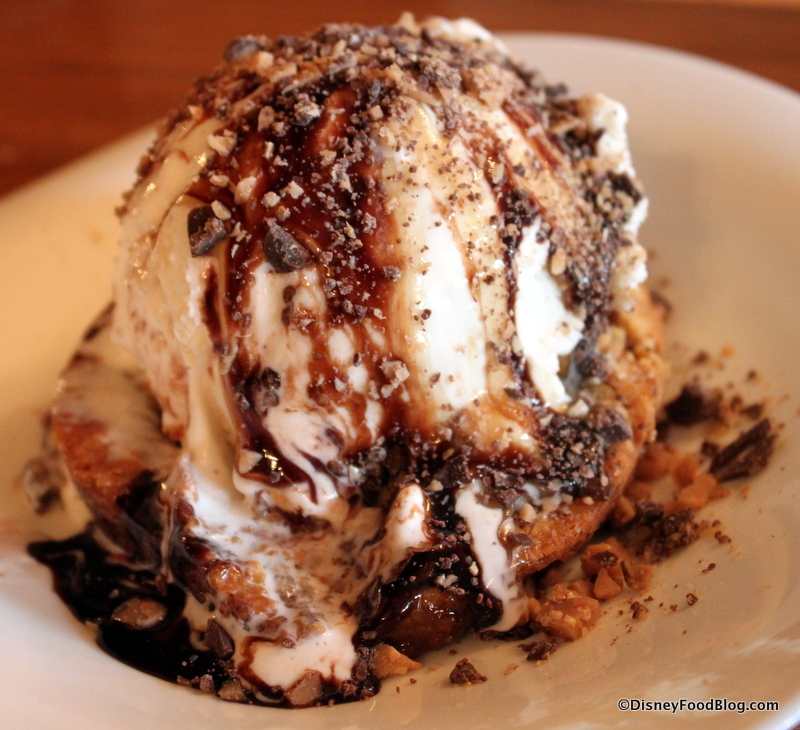 Ooey Gooey Toffee Cake at Liberty Tree Tavern — One of My Favorites! Let’s take a trip to some awesome Disney restaurants and lounges today for the latest installment in our Disney Food Pics of the Week Series! 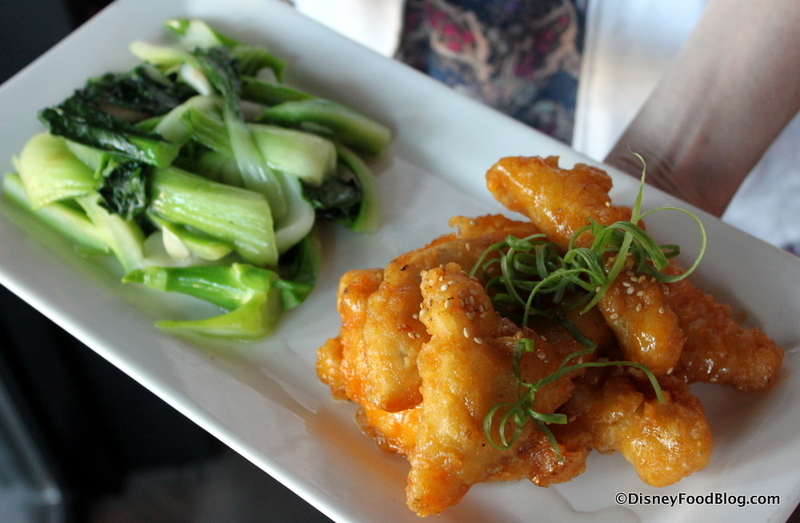 Anytime I can dine at Sanaa in Disney’s Animal Kingdom Lodge, I am so there! 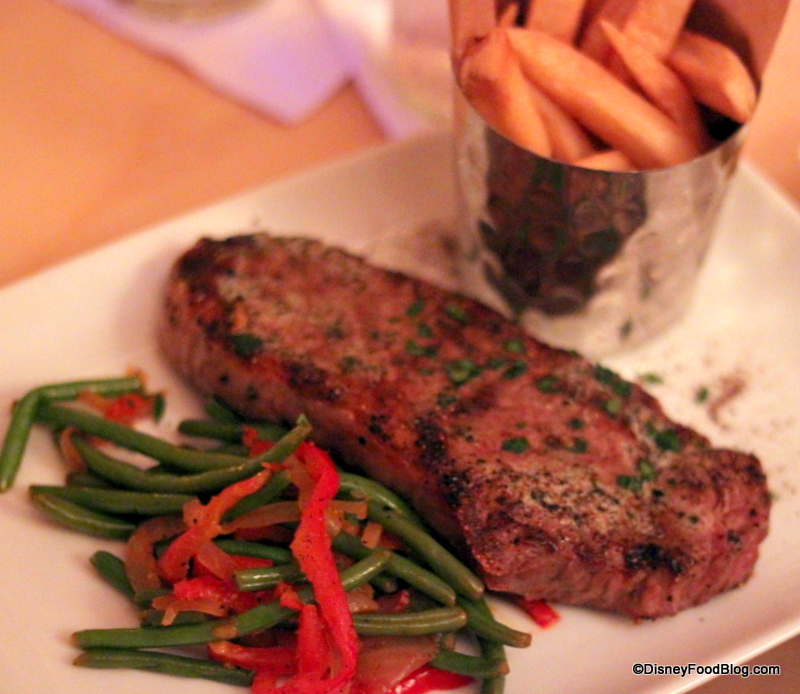 Located in Kidani Village, it’s a hidden gem with some of the most wonderful food I’ve ever had at Disney (ahem. Butter Chicken.) Desserts are delish, too! Try the Banana Kulfi if you make it here for a meal and it’s on the menu. 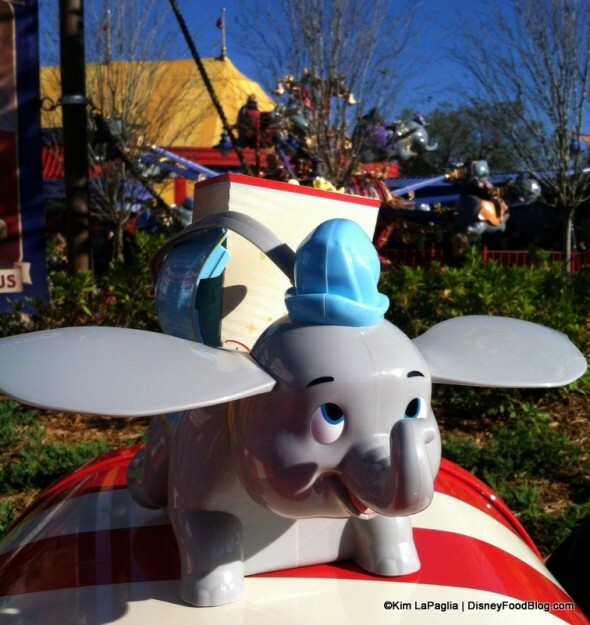 Can’t make it to Paris but you already have your trip to Walt Disney World planned? Then you’re golden. 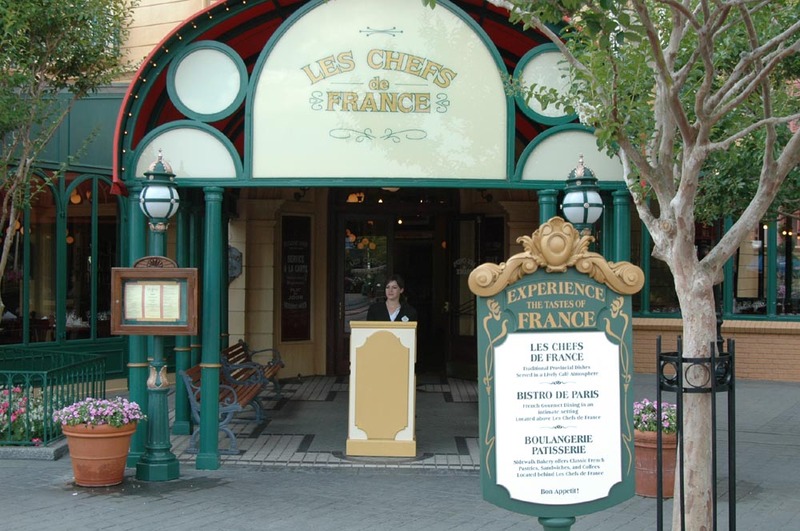 Because a trip to Les Chefs de France in the France Pavilion will positively transport you to the City of Lights. 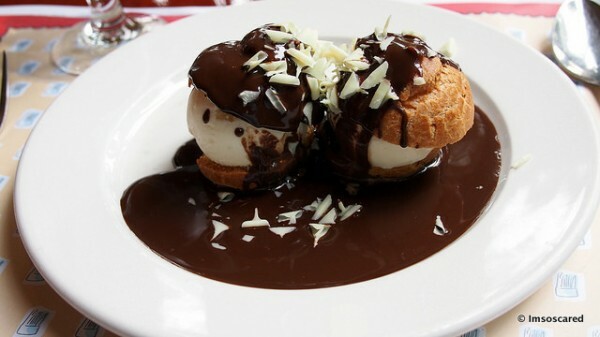 And the perfect sweet ending to a meal there is the Profiteroles au Chocolat. I can’t resist having them! Join us in welcoming guest author Eric Lane! Today, he’s sharing a review of Les Chefs de France in Walt Disney World’s Epcot. Bon Appetit! Based on its location and consistently solid food quality it’s no wonder that Les Chefs is one of the most popular establishments in Epcot. 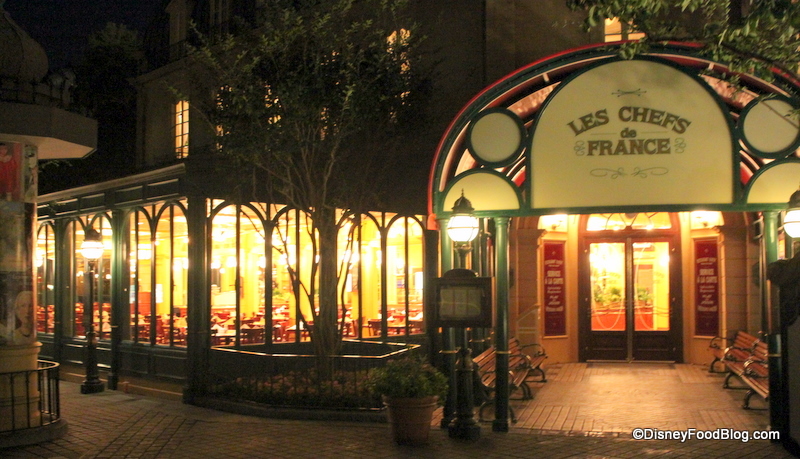 Sitting right on the promenade of World Showcase Lagoon, Chefs de France is a prominent restaurant. 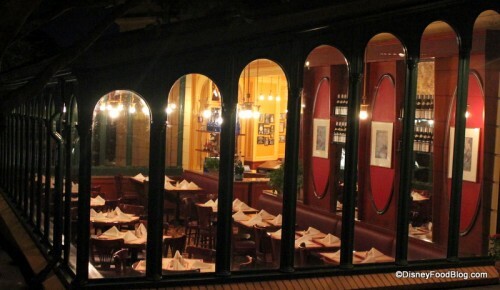 Built to replicate a French bistro, the large open interior is fronted by a long, glass sunroom. Those walking along the World Showcase Lagoon can see the diners all the way in the back, and those in the back can see all of those walking by. Our reservation was at 8:50PM and a positively bubbly maître d’ seated us right in the middle of the sunroom window. Seats against the glass were for two, we were one row away from the window. Because the whole restaurant is an open room, you can see all the waiters, everyone getting up and down, and all the people walking outside. A large floodlight outside provided an amber warmth that calmed all the hustle and bustle. We ate as the restaurant closed and slowly cleared until it was just our table and about 5 others when we were finished at 9:45PM. 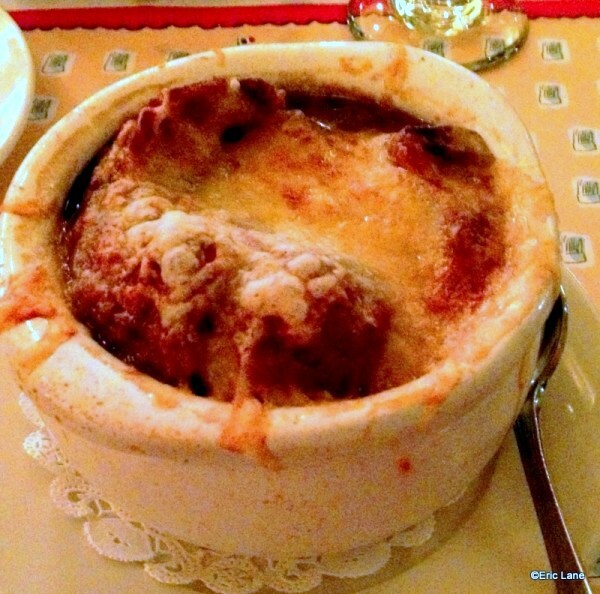 Since we were at a French restaurant I decided to start with the French onion soup. The cheese was a little sharper than I thought it would be, which caught me off guard. Although unexpected it added a welcome bite to the flavor. The onion and beef flavors were much more subtle, but the cheese didn’t overpower them. Another unusual touch was that I got the heel of the bread, which made it a little difficult to cut out a good hunk of bread with my spoon. 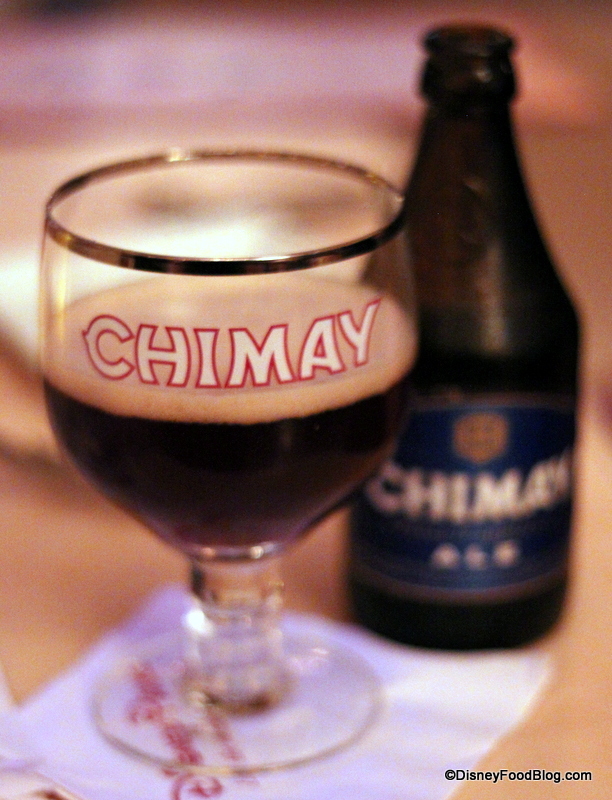 Overall good, but not enough to stop me from sampling another appetizer next time I eat here. The next dish was the ungainly titled “Filet de Saumon, pommes de terre ecrasess, au buerre et chboulette, sur coulis de tomate et poivron rouge.” That was the bold faced name of the dish, but instead of saying it while ordering or the direct English translation of “broiled salmon, smashed potatoes with butter and chives, served on a tomato and red pepper sauce” I was able to get away with just asking for the salmon filet. 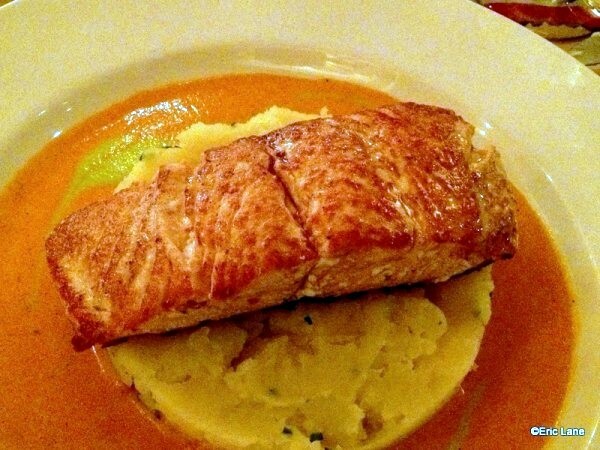 I appreciated that the sauce was not served on the salmon, but placed on the plate before the potatoes and salmon. It let me dip the salmon in the slightly spicy sauce and get just the right amount on the fish for my taste.